Terroni of Clerkenwell is a cafe and deli offering a variety of Italian light meals and drinks to eat in or takeaway. Do you work at Terroni of Clerkenwell? What did you think of Terroni of Clerkenwell? 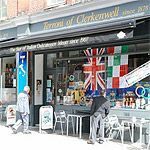 Halfway up Clerkenwell Road sits England’s oldest Italian delicatessen. 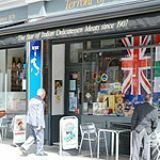 Terroni of Clerkenwell was opened by its founder, Luigi Terroni, way back in 1878, and having undergone a refurbishment in 2012 the deli has expanded into a very charming café. When Terroni originally opened back in the late 19th century, it was at the epicentre of the Italian community in London. The café and deli remains unmissable as you walk up Clerkenwell Road and the vibrant window displays filled with inviting foods and products certainly catch the eye. Once you step inside this cosy spot you'll see that one side of the room is a well stocked deli (for those inspired to whip up their own Italian cuisine at home), and the other turned into a café. This is a light and open space designed to give off a European style of casual eating. 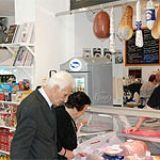 The kitchen space is open too, and here you'll find staff working seemingly non-stop, preparing lunches and drinks behind fridges displaying sweet treats and fine meats. Terroni sparkles in any crisp sun coming through the large windows, and when this happens you could almost be forgiven for thinking you were sitting in an upmarket little spot in the heart of Milan. Owing to its location, Terroni is a popular haunt for businessmen and women on the hunt for a light and fresh lunch. In this sense the clientele has of course changed considerably since the days its doors first swung open. However Terroni has not strayed from its roots and this cosy café gives off a uniquely European vibe, be it from the all Italian workforce or the hoards of biscotti, amaretti and sugar coated pastries. The staff are all welcoming and give off the feeling that they really take pleasure in what they do here. Dining space, though, is limited (so either cross those fingers or be prepared for a wait) and the toilet facilities are incredibly difficult to find; directions from two separate members of staff leads to a room occupied only by an empty umbrella stand - and not a toilet in sight. 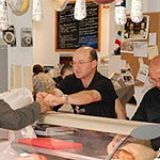 The menu is of course driven by the cuisine of Italy, and its sophisticated meals most definitely provide value for money, with all the dishes on offer created from the produce available at the deli counter. Although the menu itself is hardly huge, there is a varied lunch menu, filled with panini, pastas and pizzas for those wanting to keep things distinctly Italian. Inspired by all those impressive bits and bobs at the fresh deli counter, platters are available and at £7.50 for a single or £15 for a double, there's plenty of value to be had. Diners can chose from single mixed meat and mixed cheese platters, or have a mixture of the two. 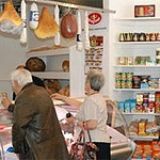 The platters are gloriously spread with carefully sourced imported cured meats and some very fine Italian cheeses. A seafood salad (£6.95), meanwhile, is another example of tremendous value for money; a large bed of salad is blended with mixed olives and squid and served with some fresh toasted bread. All meals are accompanied with quality balsamic and rich Italian olive oil for you to drizzle or dip to your heart's content. Desserts and pastries are placed right at the counter, with an array of sumptuously sweet white chocolate, almond milk chocolate, orange and chocolate biscuits dusted in sugar, fresh croissants and other impressive pastry options available to tease you at the till. A takeaway option is available too, which proves perfect for those who simply don’t have the time to dine in, as well as, of course, those who can’t get a table. Typical of its Italian roots, Terroni serves up a fine selection of wines which go perfectly with the rich meats and cheeses on offer. Customers can choose from the small, well thought out drinks menu or take their pick from the wine shelves overlooking the dining area. A glass of prosecco (£4.95) is of course on offer if you're after a bit of bubbly, but Italian beers in the shape of Peroni and Moretti (£2.50 for a 330ml bottle) prove popular too. With its Italian heritage well and truly in place, the transformation of this longstanding deli into a cosy, modern and vibrant eatery is certainly impressive. Recommended.